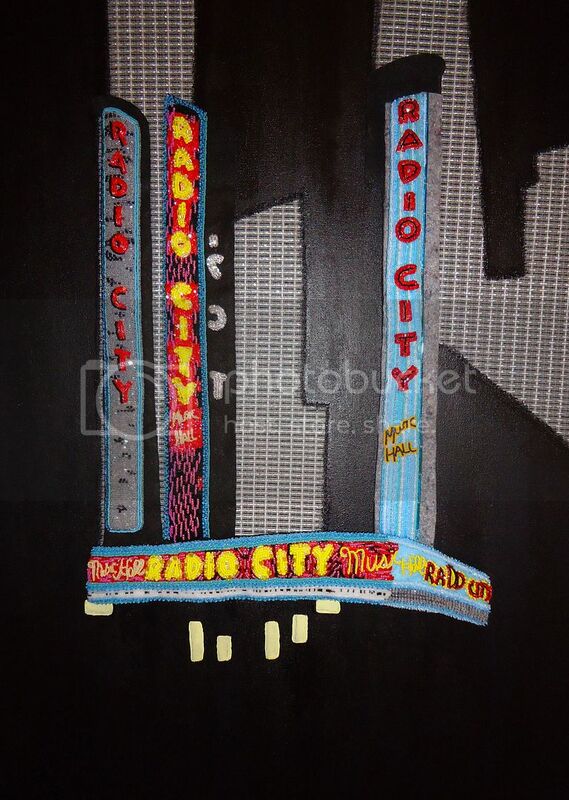 Semi-painted 40" x 30" canvas for my beaded Radio City Music Hall. First, I painted my 30″ x 40″ canvas black, then I cut out & stitched some speaker grill fabric to the canvas. This was rather difficult to do as this kind of fabric frays easily. Somehow I managed to cut out some shapes that resemble the buildings which surround my beaded Radio City Music Hall! After I stitched them to the canvas, I painted the edges to soften them up a bit. Yes, it is really looking good!!! The darkness makes everything pop. Wow. Impressive project. Can’t wait to see all of the beadwork added. That looks great! very creative.